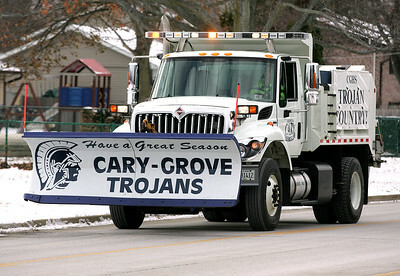 H. Rick Bamman - hbamman@shawmedia.com A Village of Cary public works plow truck drives in the send off procession for the Cary-Grove team on Friday, Nov. 28, 2014. H. Rick Bamman - hbamman@shawmedia.com The Cary police and fire departments escorted the team busses on Three Oaks Rd. H. Rick Bamman - hbamman@shawmedia.com Family members Patty Lemke, Kelly Johnson and Katie Johnson see the team off. H. Rick Bamman - hbamman@shawmedia.com The Cary-Grove football player sophomore Trevor Perez heads to the buss for the trip to Champaign. H. Rick Bamman - hbamman@shawmedia.com The Cary-Grove football players carry supplies to busses for the trip to Champaign. 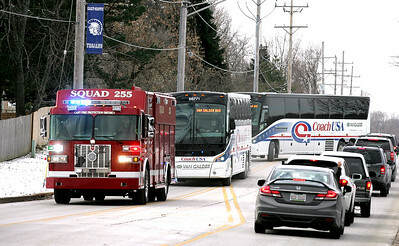 H. Rick Bamman - hbamman@shawmedia.com The Cary-Grove football players and coaches head to the busses for the trip to Champaign on Friday, Nov. 28, 2014. H. Rick Bamman - hbamman@shawmedia.com Juniors Nick Cruz (left) and Zach Cohen eat lunch before boarding busses to Champaign. H. Rick Bamman - hbamman@shawmedia.com Cary-Grove football playes load busses for the trip to Champaign on Friday, Nov. 28, 2014. H. Rick Bamman - hbamman@shawmedia.com The Buss and Miyuskovich families send off the team with a banner at the corner of First St. and Northwest Highway. H. Rick Bamman - hbamman@shawmedia.com Cary-Grove offensive line coach Matt Ruhland (right) takes roll call aboard one of the team buses. 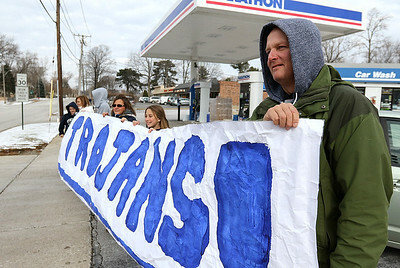 Family members and members of the community were in attendance as the Cary-Grove football team embarked on its final road trip of the season from Cary-Grove high school Friday afternoon.